Earlier this year, I got this book because I really took it seriously that I want to be recognized for my weblog--because it's an extension of myself, and I do want to be taken seriously cause I'm very sure there's a lot of extra-ordinary in me. I know there are tons of bloggers out there, veteran, with more time, exposure, experience... and the list would go on. What do I have to offer then? I am just starting! I just celebrated my official blog's first birthday last June 20 (to be exact). How do I keep up with the chase? My answer is, my heart. I've got my heart on this. Here's a list that I would like to share with you. Something I think you should know, and just in case you don't find the book, at least you read about it here. It's from "Confronting Fear of Blogging" chapter, taken from IBM's Blogging Policy and Guidelines. Respect your audience. I take this very seriously. I'm pretty sure I owe this to all my readers as much as I owe this to myself..
Show proper consideration for others' privacy. This is the reason why starting my recent contests, I will not approve comments with privileged contact information such as email, esp addresses. I value my privacy, and I don't want to be the reason why you should lose yours! Avoid topics that may be considered objectionable or inflammatory, such as politics and religion. Rather than doing this, I prefer emphasizing my advocacies. Find out who else is blogging on the topic and cite them. This is why I hope you always leave your link in your comments so I get to visit you back. I read all your comments and visit all site readers. Most of the time I comment back on your pages, on occasions that I don't, I'm sorry. Sometimes I have nothing to say, really, but more often than not, it's my internet connection--which is really moody! Don't pick fights.I will never! Be the first to correct your own mistakes.Humility is a life lesson I hope every one, including me, should be a master of some day. Admittedly, I'm not yet, but I'm going there. Thanks to your overwhelming trust. Can you believe it's just been a year and one month?! Thank you guys for the support always. 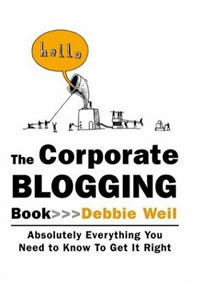 The Corporate Blogging Book (Php 399) is available at National Book Store. I'm grateful that you came across my blog and now you're following (following you too). This is a great post and your tips are so insightful. You mentioned National Bookstore. Wow! It's been years since I last went to that place. I used to buy books there but my fave is the Filipino Bookstore in Glorietta - my old stomping ground for films and Auntie Anne's pretzels and lemonade! Hope all's well. Keep in touch. wow! thank you for sharing these great tips.. really helpful and informative! I will definitely search this book! thanks again mae! mmuaah!